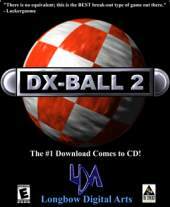 DX-Ball 2 is based on Michael P. Welch's DX-Ball, in turn based on Megaball by the Mackey brothers. Gameplay uses the Breakout idea of using a bat to guide a ball around a screen smashing bricks, without letting it drop off the bottom of the screen. It adds power-up tokens, such as - multiple balls, mounted guns to shoot out bricks, a more destructive ball, and a larger bat. Sporting a completely revised game engine with new graphics, faster frame-rates and support for in-game music via Carlos Hasan's SEAL, DX-Ball 2 is sold as five different board packs - Board Pack 1, Board Pack 2, Board Pack 3, Memorial Pack, and Classic Pack. The demo version includes a sample of Board Pack 1. Among other new features, the game also introduced two new Power-Ups: Mega Ball and Eight Ball; an easy-to-play Kid-Mode; and a euro-techno soundtrack by SideWinder, accompanying the addition of an integrated module player. Version 1.2 added, among other new features, two new Power-Ups: Mega Ball and Eight Ball; an easy-to-play Kid-Mode; and a euro-techno soundtrack by SideWinder, accompanying the addition of an integrated module player. A 20th Anniversary Edition was released in Nov/2018 re-mastered for modern PCs. Features: 150 Boards from the original Board Pack 1 (aka Full Version) plus the all-new anniversary boardset and widescreen variants; Switch between new high-res board textures or the original 90's graphics at any time; 20 classic power-ups plus the all-new punch paddle, gravity-ball, lightning and more; Compete for the best score with new online leaderboards; Includes editing tools and full workshop support for creating and sharing custom boardsets with the community; Collect in-game charms for extra points and achievements; Play in "Classic" mode with only the original features and graphics.